Periodontal disease and tooth decay are both caused by bacterial plaque (biofilm). Periodontal diseases can be accelerated by a number of different factors. However, it is mainly caused by the bacteria found in dental plaque, a sticky colorless film that constantly forms on your teeth and above and below your gum line. Bacteria found in plaque produces toxins or poisons that irritate the gums, which may cause them to turn red, swell and bleed easily. If this irritation is prolonged, the gums separate from the teeth, causing pockets (spaces) to form. 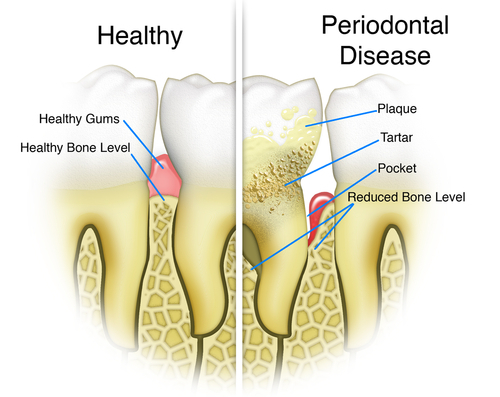 As periodontal diseases progress, the supporting gum tissue and bone that holds teeth in place deteriorate. If left untreated, this leads to tooth loss. If you do not carefully remove plaque by daily brushing and flossing, plaque hardens into a rough, porous substance known as calculus (or tartar). Daily brushing and flossing will keep dental plaque and calculus to a minimum, and remove germs to help prevent periodontal disease. A professional hygiene maintenance visit is recommended to remove plaque and calculus in places your toothbrush and floss have missed. Your visit to our office is an important part of your program to prevent gum disease. We will help you keep your teeth for your lifetime.